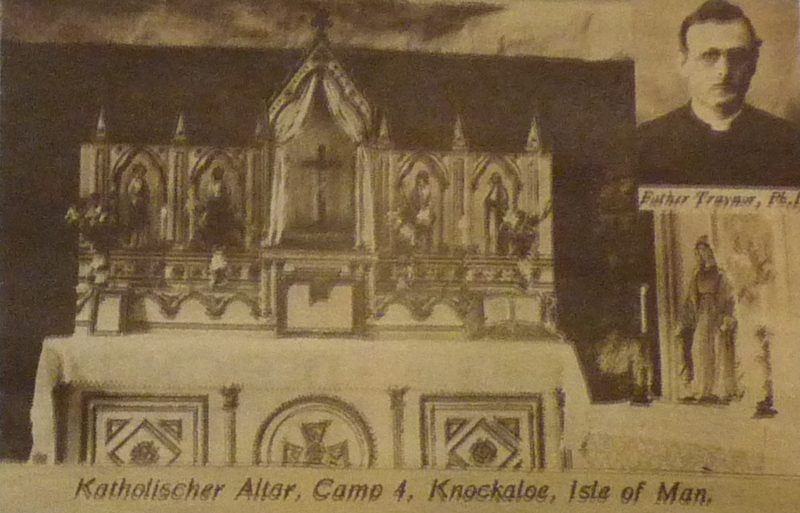 Thanks to the efforts of Canon Crookall, a Catholic chapel was established at both camps, but the ever increasing numbers at Knockaloe resulted in Father Traynor’s appointment to serve the camp and the people of Peel in their own church in Glenfaba Road. Canon Crookall served the chapel at Douglas Camp, as well as St Mary’s, Douglas, St Mary’s, Castletown, and the termporary chapel in the old Marine Biological Station below the Belle Vue Hotel at Port Erin. (Isle of Man Church Leader 2000: 5). How long he was at Knockaloe is unknown, but a pair of bone vases within the collection of the Leece Museum (Peel, Isle of Man) were made for Traynor by the internees; whilst a second pair were purchased by him for his land-lady (Isle of Man Today, 28 January 2010, internet; BBC Website, internet). Catholic Altar, Camp 4, Knockaloe and Father Traynor (Isle of Man Church Leader Nov/Dec 2000: 5). He became curate at St William’s, Ince where he ministered until 1923. He moved to St Marie’s, Southport for a short time (1923-1924), before transferring back to Upholland where he became Professor of Philosophy (1924-1928). He was became parish priest for Our Lady and St Bernard, Liverpool where he ministered until his death (1928-1948). In 1936 he was appointed a Domestisc Prelate (Right Rev. Monsignor). Traynor returned to the Isle of Man in 1939, part of delegation from Liverpool who came to open the new Catholic Church in Pulrose. 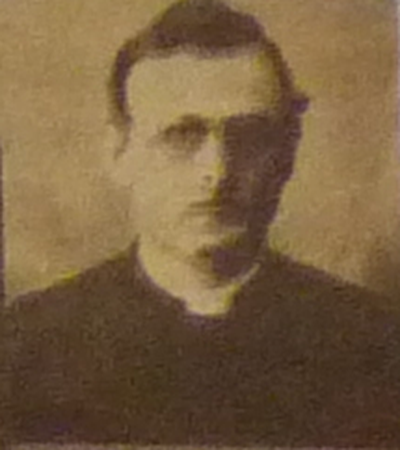 Monseigneur Traynor at the opening of Pulrose Church (1939), (Isle of Man Weekly Times, 5 August 1939: 16). Anon. (2000). ‘A Catholic Chapel was established at Knockaloe Camp’. Isle of Man Church Leader Nov/Dec, pp. 5.